On their way to Grid Section B to meet up with Oddball’s tanks, (depending on how they faired on the hilltop) Kelly’s platoon either drives down a dirt road and hits a mine or they’re walking in a newly planted field and hit a mine. The Germans will show up in about 5 minutes. For purposes of KH Minefield: At the end of 10 turns after explosion, the Germans show up. Note: Field has anti-personnel mines and road has anti-vehicle mines. See NEW RULES – MINEFIELD and NEW RULES - BAYONET PATHING below. 1) Plowed Field 2) Growing Fields 3) Road 4) Rock Wall 5) Low Rock Wall 6) Stones 7) Allies Enter Here 8) Driving Allies Enter Here 9) Germans Enter Here. Unless you know you’re in a minefield (signs, told, etc. ), your first inkling is an explosion with injury. 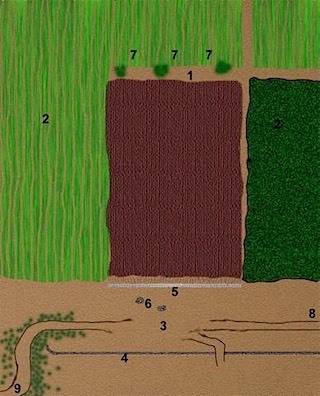 1) Place half the figures in the minefield (the newly planted field) and ½ above it. 2) Move the troops are plodding along at move=4” per activation. There are no Germans just yet, so the Germans get no move. 3) On the first doubles activation, a mine has gone off. If no mine goes off, there is no encounter and you get to the Big Bridge with all the troops. 4) Move all figures, then make Rep rolls on each figure. Re-roll all failed 0d6 Reps until you get the last Failed Rep and that is the figure that gets it RIGHT NOW. The explosion is the last action for this turn. 5) Consult the Ranged Combat Damage Table. Everyone drops in place. Troops get Anti-personnel mines. If you are going by vehicle, then you are on the road. 1) Start with lead vehicle on exact center of road, with each other vehicle behind it as you feel appropriate. It is OK if the vehicle is off the map. 2) Vehicles are moving between 4” to 10” speed. 3) Doubles in Activation designates a hit. 4) To determine which vehicle hits the mine, have each vehicle roll 1d6 (with the first vehicle adding 1 to die) (and the last vehicle subtracting 1). Any ties are re-rolled. The highest number hits the mine causing damage roll and any injuries. 5) See KH Penetration Below: Immediately roll Activation with vehicles moving their 4” to 10” distance to stop including the exploded vehicle. If it is a vehicle that is off the board, it either does its coasting onto the board or is placed right at the boards edge. Note: No other Road Mines will go off for KH Game. NEW RULE - Bayonet Pathing – Any figure bayonet pathing is prone or kneeling and cannot fight while pathing. They must have a bayonet or knife/sword to test. They move only 2” per turn and for the purposes of KH minefield, they will never hit a mine while bayonet pathing. If you get to a path that is already cleared, you may get up and walk/run and can defend yourself. You can always stop Pathing to defend yourself. · Mine flattens tire/disables links, but does not penetrate vehicle. Occupants can get out of vehicle normally. · Mine disables vehicle and each occupant must take “Recover from Knock Down” test (infantry Reaction Test QRS at end of book) Otherwise, they must bail out. · Mine destroys vehicle. And each occupant must take “Recover from Knock Down” test at -1. These are the German Infantry that arrive to investigate the explosion. The commanding officer is very lax on this patrol, probably because he‘s already been out to several exploded cows. Unless there is something obvious to see as they come round the bend, they will continue to be lax until the binoculars are used. (3) This is from NUTS! German Infantry List page 11. The movie had several SMGs and the rest were BA Rifles. Don’t forget the one LMG in the truck. (4) The officer came on this patrol from the army camp just over the next hill. (5) The squads are arranged into 12 troopers and 2 non-coms because the rear of the trucks showed 6 soldiers per bench with 2 in the cab. There is one squad per truck, so you need to fill these in. If you played “Hilltop”, remember your salvage limitations.